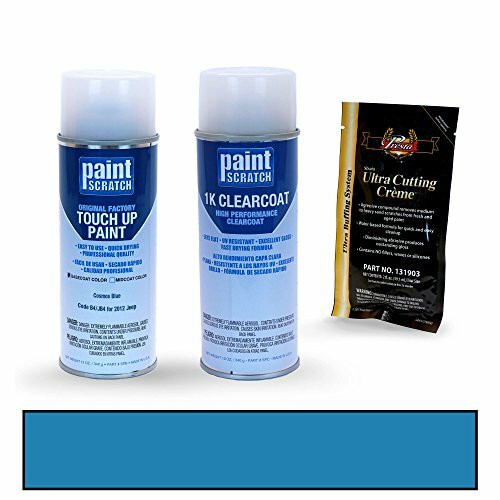 You are ordering a touch up paint Spray Kit of Cosmos Blue B4/JB4 for 2012 Jeep Wrangler from PAINTSCRATCH. Original Factory OEM Automotive Paint - Color Match Guaranteed. You MUST VERIFY YOUR VEHICLE COLOR CODE IS B4/JB4 to ensure you are ordering the correct paint color. DO NOT order based on the product picture or color name on this page. Where to find your color code: The color code is located on radiator support or driver's door jamb. Automotive paint is very hazardous. Keep away from children. Do not use any of the products until you have read and understand the product directions and warnings. We recommend rubber gloves, chemical respirator, safety goggles and to work in a well ventilated area. Please store the materials in a safe place.